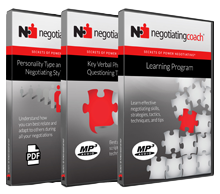 Negotiation tips, phrases, strategies, tips, tricks, quotes, case studies and advice from The Negotiating Coach. https://negotiatingcoach.com/wp-content/uploads/2017/04/negcoach-logo-new2.png 0 0 The Negotiating Coach https://negotiatingcoach.com/wp-content/uploads/2017/04/negcoach-logo-new2.png The Negotiating Coach2018-04-15 06:12:552018-04-16 17:34:47Questions? https://negotiatingcoach.com/wp-content/uploads/2017/04/negcoach-logo-new2.png 0 0 The Negotiating Coach https://negotiatingcoach.com/wp-content/uploads/2017/04/negcoach-logo-new2.png The Negotiating Coach2018-04-15 05:36:092019-01-30 01:40:26Negotiating Challenges?